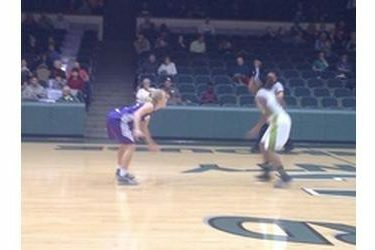 In a matchup of top 20 teams, Seward played some of their best defense of the season. The #16 Lady Saints handled the #19 Butler Lady Grizzlies 75-40 Wednesday night in the Green House. Seward shot 53 percent from the field while Butler was 13-51 for 26 percent. Butler had 25 turnovers. Seward’s twin towers were dominant as Joanna Grymek scored 21 points with seven rebounds and Axelle Bernard had 20 points and seven rebounds. The two combined to go 18-23 from the field. Tiani White added 10. Seward is 9-2 and 2-1 and Butler is 11-3 and 1-2 in the KJCCC. Seward hosts 8-4 Pratt Saturday night in the Green House at 6 with 5:45 Saints Shootaround on B107.5 and kscbnews.net. Billy’s/Ayr Lanes is the buyout sponsor.